Dieng Volcanic Highland is one of the most intensive potato agricultural land in Indonesia, as well as frost disaster prone area. Frost indicated by appearance of frozen dew on the ground or vegetation surface due to cold temperatures during dry season. 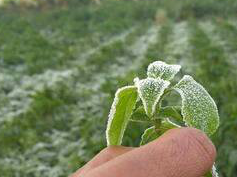 Frost causes damage to leaf tissue in potato plants, resulting crop failure and losses of up to tens of millions. Disaster management needs to be assess in order to achieve Disaster Risk Reduction (DRR) on agricultural land. This research aims to identify frost hazard areas based on local physical characteristics, analyze frost impacts on agricultural land, and provide preparedness recommendation to reduce the impact of frost disasters in Dieng Volcanic Highland. Research was conducted in Dieng Village, Wonosobo and Dieng Kulon Village, Banjarnegara. Method to assess hazard level was performed by spatial mapping technology using ArcGIS and comprehensive analysis using frost assessment through combinations of geomorphology, land use, proximity to water bodies and weather aspects. Dieng Volcanic Highland has a 125.59 hectare frost hazard areas, as many as 58.4 hectares of hazard areas are dominated by high level, while 24.84 hectares are moderate level and 42.95 hectares are low level. Cropland dominated by potato commodity has the highest hazard level, frost incident causing agricultural commodities to wither to death so that farmers experience losses. Frost losses in Dieng have a range from 800 thousand rupiah to over 155 million rupiah and only destructive on potato farm. In order to encourage agricultural resilience and reduce the loss of frost disasters, effort of preparedness can be done by passively and actively methods. Passive methods includes site selection, early warning system, shifting commodities, cropland modification, and appropriate calendar planting. Active methods includes frost modification using heaters, blower and sprinkle irrigation, and cropland covering using mulch, plastic or nets. Dieng; Frost; Hazard Mapping; Potato Agriculture; Preparedness. Ahrens, D. C. 2009. Essentials of Meteorology: An Invitation to the Atmosphere. USA: Broks Cole. Andrianto, A. 2015. Embun Upas Merusak Ratusan Hektar Tanaman Kentang di Dieng, Jawa Tengah. [online] Tempo News. Available at: https://m.tempo.co/read/news/2015/08/15/ [Accessed 20 September 2017]. Dalezios, N. R. and Nastos. 2017. Chapter 7 Frost and Heatwaves. In: Dalezios, N. R., ed., Environmental Hazards Methodologies for Risk Assessment and Management. London: IWA Publisihing, pp. 246-277. Edy, S. K. 2010. Usaha Tani Kentang Dengan Teknik Konservasi Teras Bangku di Dataran Tinggi Dieng Kabupaten Wonosobo Jawa Tengah. Jurnal Pembangunan Pedesaan, 10(2), pp. 115-127. Hansen, C. and Meiklejohn, K. N. 2014. An Evaluation of High Altitude and Latitude Diurnal Frost Environment: South Africa, Marion Island, and Antarctice. Paper presented at the Biennial Meeting & Open Conference, Auckland, New Zealand. Huwae, E. 2016. Tanaman Kentang Terancam Rusak Akibat Embun Upas. [online] Raya Pos. Available at: http://rayapos.com/tanaman-kentang-terancam-rusak-akibat-embun-upas/ [Accessed 22 September 2017]. Kalma, J., Laughlin, G., Caprio, J. and Hamer, P. J. 1992. Advances in Bioclimatology: The Bio Climatology of Frost Volume 2. Berlin: Springer. Kotikot, S. M. and Onywere, S. M. 2014. Application of GIS and Remote Sensing Technique in Frost Risk Mapping fro Mitigating Agricultural Losses in the Aberdare Ecosystem, Kenya. Geocarto International, pp. 104-121. doi: 10.1080/10106049.2014.965758. Levitt, J. 1980. Responses of Plants to Environmental Stresses, Water, Radiation, Salt and Other Stresses. London: Edition Academic Press. Mahi, A.K. 2015. Survei Tanah.Yogyakarta: Graha Ilmu. Pradana, A., Helen, F. S. and Wahdaningrum, W. 2015. The Analysis of Environmental Degradation and Carica Agroforestry System as an Attempt of Environmental Restoration in Dieng Plateau. International Journal of Environmental Science and Development, 6(11), pp. 861-867. Ridho, M. 2017. Embun Es Dieng. [online] Regional Liputan 6. Available at: http://regional.liputan6.com/read/3082522/embun-es-dieng [Accessed 25 September 2017]. Synder, R. L. and Melo-Abreu, J. D. 2005. Frost Protection: Fundamentals, Practice, and Economics. Rome: Food and Agricultural Organization of United Nation (FAO). Tjasyono, B.HK. 2004. Klimatologi. Bandung: Institut Teknologi Bandung (ITB). UNISDR. 2017. International Strategy for Disaster Reduction. [online] UNISDR. Available at: http://www.unisdr.org/ (2009) [Accessed 15 September 2017]. Van Westen, C. and Kingma, N. 2005. Multi-hazard Risk Assessment Session 5. Enschede: ITC. Verstappen, H. T. 2014. Garis Besar Geomorfologi Indonesia. Yogyakarta: Gadjah Mada University Press. Wang, J., Yue, Y., Zhao, J., Bai, Y., Lv, L. and Shi, P. 2016. Snow, Frost, and Hail Disaster in China. In: P. Shi, ed., Natural Disaster in China. Berlin: Springer Nature, pp.187-237. Webb, L. and Synder, R. 2013. Frost Hazards. In Bobrowsky, P.T, ed., Encylopedia of Natural Hazards. Dordrechtr: Springer, pp. 363-366.